Yesterday we kicked off the 2006 PopCult gift guide with five cool items that are available nationwide. Today we’re going to narrow our focus and suggest gifts that originate or are based in Charleston, West Virginia. You can take the easy way out this holiday season, and give gift certificates from two of Charleston’s coolest stores. The Purple Moon is West Virginia’s only shop dedicated to vintage mid-century modern art and contemporary design, furnishings, accessories and art. They’re also the exclusive Charleston dealer in the famous Kit Kat Clock from last year’s gift guide. Chuck and Connie at The Purple Moon are great folks and you’ll be able to see their store in the next episode of Radio Free Charleston. If you have a fan of atomic-age retro design, you can’t go wrong with a gift certificate in any denomination from The Purple Moon. Call 304 345-0123 for details. Taylor Books offers a gift certificate that can be used for books, classes, art and crafts. They come in books of ten certificates which are worth a dollar each. This is a great way to let the person on your gift list pick out their own book or art from Charleston’s coolest bookstore. Call 304 342-1461 for more information. We are lucky to have an internationally-recognized wrestling federation right here in Charleston. IWA East Coast presents a variety of top wrestling talent from all over the world, and puts on incredible shows at their home base at the South Charleston Community Center. You can purchase DVDs of their shows from SmartMark Video. I ‘d recommend “Stars With Scars,” their most recent show, due to the amazing title match between Chris Hero and Jerry Lynn. You also can’t go wrong with either of the tournament DVDs, both filmed on September 16, 2006. Last September Danny Boyd put on a wrestling show at the Davis Fine Arts Auditorium at West Virginia State University. I wrote about the event here, and covered the DVD release party here, just last week. You can order your own copy from the AWA website and see what all the fuss was about. This is a great evening of old-school wrestling, wonderfully directed by Amy Trent, and it’s a great look at Danny “Professor Danger” Boyd in action. 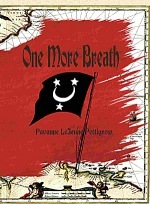 Local author Pavanne LeJeune Pettigrew has crafted a wonderful pirate adventure in “One More Breath,” the first novel from Headline Book’s new Publisher’s Page fiction imprint. The story of Captain “Blackjack” Bellamie and his struggle to elude capture in the Caribbean is filled with suspense, romance, and swash-buckling action. Pettigrew mixes her interest in pirates with a lifelong interest in Romany culture and delivers a first-rate pot boiler. And it’s so refreshing to read a work by a local author that doesn’t revolve around coal mines. You can purchase “One More Breath” at Taylor Books and Frog Creek Books, as well as other area booksellers. That wraps up this year’s PopCult gift guide. I hope you got some good ideas for last-minute gifterization. Next week in PopCult we’ll have the production notes for the Christmas episode of Radio Free Charleston, as well as a cool Song Of The Week and photos of my GI Joe Christmas Tree.